1. The main character(s). It is very important for me to feel a connection with the MC. I need to like them in order to enjoy a book. Nothing is more annoying than a MC who is whiny/shallow/arrogant/any other negative word. I’ve had many times where I wished the MC just died and that isn’t the best way to look at a book. 2. Slow or inconsistence pace. There is nothing wrong with a slow start. Some books are very effective when things slowly unravel, but most of the times it just makes the story drag. It feels like the story stays in one place and it makes it hard to continue. What I also hate is a pace that keeps changing. The beginning is fast and you are thrown into action, but the middle part is spread and takes a lot of time, before you end in a rushed ending. It makes a book feel very chaotic to me. 3. Boring plot. This happens for me in books where the romance takes the main stage. If I want a lot of romance, I’ll read a romantic book. If I read a fairytale/dystopian/etc. book, I want only that! There is nothing wrong with a touch of love, but in the end I want a more interesting plot. If someone is murdering young children, I want my story to evolve around that mystery. I don’t want to read about a girl who swoons over her new boyfriend she only met three days ago. 4. Writing-style. Some books just work for me, but there are a lot of books I couldn’t read because of the writing-style. It’s hard to explain where those books go wrong, but I think you all know a book like this. One of the things I always notice are the dialogues. Some authors make them choppy and unrealistic. It can be so painful to read dialogues like that. A writing-style is especially good when it doesn’t feel like reading: it’s more like you are watching a movie in your head. There are many other things I dislike in books (think of: insta-love and lack of world-building), but they are not bad enough to make me DNF it. What are reasons for you? Or do you finish your books? My first DNF this year was probably the fastest DNF I have ever had. After 20 pages I decided that it wasn’t going to work. There was something about the writing-style and the main character that didn’t felt right to me. I must say that the mixed reviews also played a role. A lot of readers had problems with the.. not so smart and childish Molly. I could already feel that sipping through the pages, so that made me decide to quit reading. 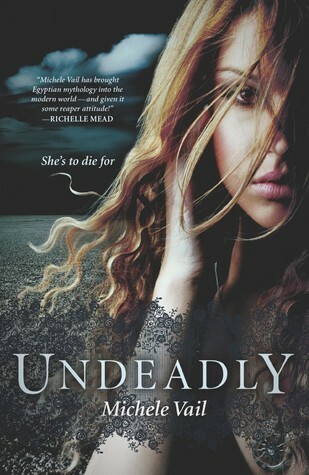 I’m talking about Undeadly from Michele Vail. Molly Bartolucci wants to blend in, date hottie Rick and keep her zombie-raising abilities on the down-low. Then the god Anubis chooses her to become a reaper—and she accidentally undoes the work of another reaper, Rath. Within days, she's shipped off to the Nekyia Academy, an elite boarding school that trains the best necromancers in the world. And her personal reaping tutor? Rath. Life at Nekyia has its plusses. Molly has her own personal ghoul, for one. Rick follows her there out of the blue, for another...except, there's something a little off about him. When students at the academy start to die and Rath disappears, Molly starts to wonder if anything is as it seems. Only one thing is certain—-Molly's got an undeadly knack for finding trouble. What is your recent DNF and why? I don't like it when the romance overshadows the plot, either. And I'm the same way, if I can't connect with the mc I can't read on no matter how good the plot is. Great post! Exactly. My hate for the MC can spoil all the fun I have in a good plot. I have a huge problem with the unrealistic dialogue. I start reading it as a joke not because it's actually any good, so I end up looking at the whole book as a joke and not a serious attempt at writing. I also don't like when the romance takes first stage and the plot is left in the background. I have a system where after the 15-20% mark if I'm not into the book then I either finish skimming it or not finishing at all. Great post! Slow starts always kill it for me. Not so much the main characters, while I tend to talk about the characters for most of my reviews, I still don't mind a while heap. Undeadly sounded really intriguing when I saw it at the shops the other day but I don't think I'll be reading it after seeing 7 DNFs. I don't mind a slow-paced book, but it needs to offer up something to keep my interest. Boring or irritating main characters, premises I've read dozens of times already, pointless love triangles, books that seem too young for me -- all these things cause me to DNF a book. 'Books that seem too young for me', that's a good one! I like to think that I'm pretty patient with books - giving them chance after chance, but it really depends on my mood. If I went through a bad day and have little patience, I might just DNF a book because I wasn't enjoying it at that time. Mostly though, I DNF for the same reasons you do. I agree, books that start off with a bang only to become slow would most likely end up to become a DNF; or if I really, really couldn't connect/like ANY of the characters, then yes, I wouldn't feel very interested to continue either. Haha, I came near to DNF'ing Undeadly as well, but saw that I was nearing the end (about 65 - 70%), so I decided to just finish it. Not the best decision I made, I can tell you. Anyway, it's mainly the major things that make me give up on a book, not love triangles or insta-love or poor world building. This is a great addition to your Fairytale News feature, Mel! The make and break thing in a books always turn out to be the characters and the writing. The storyline doesn't bother me that much as long as the characters are interesting. My recent DNF was The Symptoms of my Insanity. It was just awful, bad writing, bad characters, and even worst storyline. It did not work for me. That does sound quite horrible! My latest DNF was Parallel (I don't remember the author - HC release, pretty white cover). I expected a lot from that book but I ended up with love triangle drama, which is something I just can't stand. I actually rarely DNF, but when I do, it's because I don't feel that the book has anything new to give me. I haven't DNF-ed anything recently-I have been very good about finishing. I can make it through slow books if I've seen reviews promising that the slog is worth it-that is why I rely on my fellow bloggers so much! I've missed your new meme somehow until now. I was just thinking last night how I wanted to start discussions about different bookish things and here you are doing just that. :) I'll probably start up a similar meme soon. I'm going to be DNFing books more. 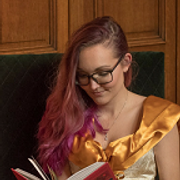 I usually try to finish a book, especially if it is for a book tour or for NetGalley, but I've decided that it's just not worth it when I have so many other books I'd rather be reading and I've put off because they don't "have" to be read. I DNF Dear Cassie. I might pick it up later, but it started right off with a bunch of language and I just didn't feel like reading that at the time. I have two books right now that I'm debating on finishing or not. We'll see. My DNF reasons are tons of bad language, sexual content, poor writing, bad grammar, characters I don't like, unrealistic characters, and plots that don't make sense. Sometimes it's a slow start, but not always since I enjoy classics and those normally are slower. A book doesn't have to be a page-turner for me to like it. Thanks for stopping by my STS/IMM! I completely agree. I used to be very strict about reading books from Netgalley, but I just can't do it anymore. I think sometimes it's also about your mood. I have some books I've tried, DNF and picked up later and I did like them in the end. You hit some excellent points Mel! I used to always finish books as well. I still mostly finish them. I think I've had less than five books I consider DNF. this year was one, but.. I'm still waffling on picking up and finishing. Zenn Scarlett, I stopped because of the tremendous amounts of info dumps. So I would include all your points on my list and add in that one. Oh yeah, info dumps are hard! But sometimes better than no information at all. I agree with you on your points, Mel. But for me, a way to avoid DNFs is not to pick up something that I know I won't love. My most recent DNF is Walking Disaster and the other one is Black City. I might pick those up later on but not now. And DNFing Undeadly is definitely the right move to make; I wanted to DNF it, but the beautiful cover convinced me not to. Seriously, wasn't Molly the slowest character ever? And the writing style - I still remember this one quote: "Let's have a convo." Like, what? No one says that! I think I cracked up when I read that. My last DNF was Stormdancer by Jay Kristoff. His prose was just WAY too wordy and overly descriptive. It took pages and pages for him to describe something, which meant that the plot moved at the pace of a snail. Definitely not for me! I don't actually DNF all that often, and don't have a set of qualifiers that make me immediately decide to stop reading a book. But I agree that the main character definitely plays a factor! Funny, I tend to really like wordy and descriptive pose, so perhaps that is a book for me :D Or I might end up with your thoughts "pace of a snail"
It's so weird, but I rarely ever have a DNF. I can't honestly say why, but it's the same reason (I think) why I rarely have a book i TRULY dislike. I haven't had a recent DNF that I can remember, oh WAIT my most recent was The Experiment in Terror (i think that's what its' called?) It's a series? I read the first one Darkhouse and gahh it just got on my nerves. NOTHING was happening. It felt ALL the time like I was READING a book and never getting past that feeling, where you're just IN the story. In the past, usually the reasons I DNF are because I just can't get into the writing style, and I can never pinpoint what it is. One of the authors that is really a touch and go with me is Stephen King. I can get into some of his books, but most of them there's just something about his style that grates on me. I have nothing against him as an author, I know that stories and styles are completely subjective - as they should be. Great topic, I'm always curious why other people DNF books. Especially it seems like there's some people who DNF quite frequently and others who hardly ever do. It's great that you rarely have a DNF and dis-likable books! King can be quite hard to digest, I agree. My most recent DNF is Chaos Of The Stars by Kiersten White. The MC was so irritating! Oh boy! I'll be reading that one soon for review..
My most recent DNF was Oxford Whispers. The style of writing was so choppy and confusing! I couldn't take it anymore at 50% and gave up. If I don't like the main character, finishing a book is really hard. I can overlook slow pacing if I really enjoy the protagonist, but everything just goes downhill when I realize that I won't like the MC AT ALL. My last DNF was Awakenings. I was reading it for a blog tour so I tried so hard to get through it, but I eventually dropped it at 80% or so. So close! I completely agree with everything you said! Honestly, even if the plot and writing is awesome, I have to feel connected the characters, especially the main one, if I have any chance of feeling strongly about a book. I usually give something anywhere from 50 - 100 pages before I decide whether or not to keep reading. My most recent DNF is Starcrossed by Josephine Angelini. The protagonist was driving me nuts and I could immediately tell it would be filled to the brim with insta-love. Yeah, I've heard some negative about Starcrossed before. Definitely agree! I do not want to force myself to read a book if I'm not liking it. There are soooo many books in my ever growing TBR pile, so why waste time with books that just don't work for me? Defintiely the most important thing for me is being able to connect and like the MC. That's not to say the MC has to be perfect, but I need to like him or her. I know fairly speedily (sometimes I do rush myself, unfortunately, but once I've decided I don't like a book, at least in that reading, I can't go back on the decision- I just close myself off from the story, it seems) whether or not I like a book enough to continue with it, or whether (in the case of librar books) if I ought to try ordering it again at a different point. I do feel guilt if it's a review book and I can't make my way through it, but I hate the idea of pushing through a book I dislike, even though I have before! Review books are always difficult when it comes to DNF. Undeadly was a DNF for me, too. I used to finish every book I started because I thought that the book might get better right after the point I stopped. I soon learned I was deluding myself. :( I still don't DNF all that many books, and I review even less DNF books, but I'm getting better. My reading time is too precious to me these days. :) Great post! I don't DNF a lot of books either, but I'm much easier now. One of the reasons why I don't want to read The Collector is the sound of the MC. And I agree :) There is already so little time to read. I never understand people who make themselves finish a book that they hate. I'm pretty quick to DNF because there are so many books that I want to read. Dialogue is really big with me and if it is awful then I just can't get through the book. That's one of my biggest pet peeves. I used to think "perhaps it's going to be better" or "I might miss the most exciting part now" and I ended up finish it.. But now I'm just skimming or I DNF it completely. I'm like you, anymore if I don't like the book I don't force myself through it. Too many other books to read to waste time on something that makes me want to bash my head against a wall! 1. I hate those kind of books, where I just wish the main character would die. You're supposed to be able to root for them! 2. I have mild ADD, so when a book takes any more than about 50 pages to pick up, it's probably not going to hold my attention span! 3. OMG YES. I'm not a big fan of romance, and if I'm looking for a DYSTOPIAN, I'm usually picking it up for the plot. Too much romance (or cheesy romance) ruins a lot of books for me. I want action, darnit!! 4. It has to be really terrible for me. Usually if it's sophomoric. My biggest issue is world-building. I'm a world-building whore, if I have too many questions about the world then it reaaally drags the story down for me. I need my fictional worlds to make sense! And instalove is the quickest way for me to want to DNF something. If the L word rears its ugly head in the first half of the book, I'm going to be so annoyed with that fact that I won't be able to focus on the rest of the story.